On monday Conrad and I did a scenic little tour around the Hidden Lake Peaks. After racing my 4runner up the bumpy road, and loading my pack up with a couple of tasty liquid training weights, we were hiking up the bare trail sometime well into the ninth hour of the day. The trail is conveniently hikeable to where it leaves the forest, and easily skinnable after that, though there is a lot of avy debris to negotiate. On the west facing slopes above tree line we found a mixed bag of windslab of varying thickness, windboard, and some full on pow up to 8 inches deep in sheltered spots. I was surprised and very glad to see soo much new snow. The soft snow seemed reasonably well bonded, and the pockets of windslab weren't deep enough be of much concern, but we discussed the potential to release pockets of windslab on steeper slopes. As forecasted, the wind was very light, and temps were warm. We followed the skintrack that the party ahead of us set to the summit of the northern Hidden Lake Peak, and chatted briefly with them before they skied down the northeast slopes of the peak. 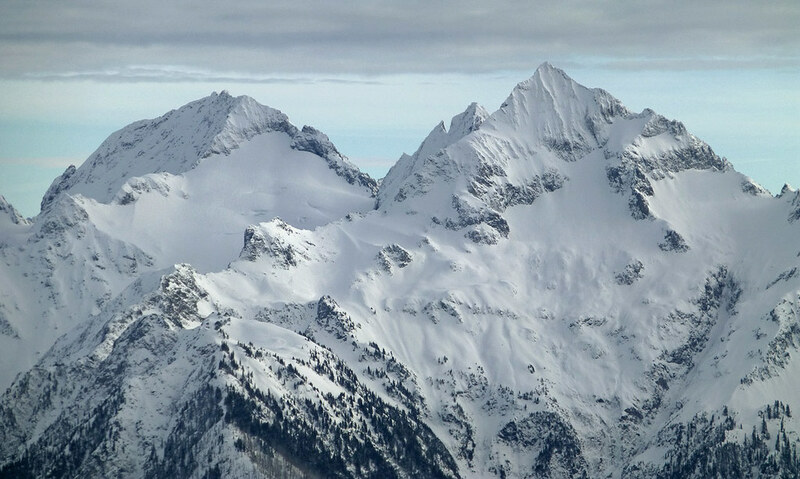 Then we killed some time eyeing the surrounding peaks. Conrad and I were both drawn to this steep north facing gash of a couloir cutting through the cliffbands on the southern side of Hidden Lake. It was hard to determine whether or not it would be skiable through the choke at the top, but it looked promising, and we suspected it would be holding nice snow. We rode variable and wind affected, but generally soft snow a couple of hundred feet down west facing slopes, then transitioned and traversed to the low saddle between the north and south peaks. We stashed our beers in the snow at the saddle, then ripped our skins and traversed around the to the ridge extending east of South Hidden Lake Peak. I rode my splitboard in split mode sans skins for the sake of efficiency. After working our way along the south side of the ridge, we climbed up and dropped onto the north side to inspect the entrance to our couloir. yes we had to do some of this, and yes it was lots of fun. To our dismay, closer inspection of the couloir revealed a steep and icy choke much narrower than a ski width, and rocks below that. It may have widened right below there, but from our vantage we couldn't tell, and neither of us felt like committing to the unknown given the consequences should we take a fall down the narrow rocky chute. We decided next time we would bring a rope, and with our tails between our legs retreated towards the fire lookout and cold beers. Conrad skinned up the mellow east ridge, and I skinned back up the the saddle to retrieve our beer, then climbed the short and steep north ridge. I followed a track up fingers of snow winding through the granite slabs, making deliberate foot steps and using handholds on rock when I could find them. It was a fun climb, and enough to get my adenaline going a little bit. The snow was variable pow and crust, but it rode nicely enough. We watched the sun disappear below the horizon, then traversed north along the summer trail, and took a shortcut down a narrow gulley.� Unfortuntately it ended in a snowed over watefall, but we were able to sidestep/sideslip down it to the avy strewn slopes below, and make bumpy turns back to our trail shoes. A quick headlamp hike down the trail got us back to the 4runner before we knew it. Super nice work. Looking forward to that tour myself soon! Great pics and video and narrative. no wind?! it sure was howling through cascade pass on sunday. there are a few cool chutes around hidden lake.... i've looked at that skinny one and wondered myself. Wow, beautiful spider/formidable photo. 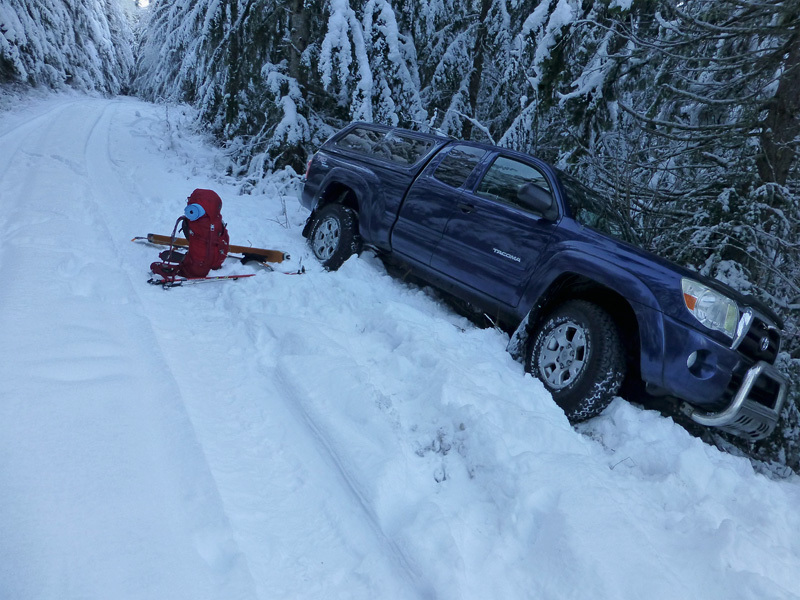 And ouch, poor Tacoma!